1Department of Biotechnology, Mizoram University, Aizawl, Mizoram – 796004, India. 2Department of Zoology, Mizoram University, Aizawl, Mizoram – 796004, India. Northeast India is rich in medicinal plants and is unique in the diversity and traditional utilization of these plants. The region might be harboring distinct phytochemicals which might be geographically significant in the Indo- Burma hotspot region. Carica papayaa well known medicinal plant is used as folk medicine in Mizoram, Northeast India for multiple purposes but there is no proper scientific study is available to find out the pharmacological activity of this ethnomedicinal plant. Total phenolic content, total flavanoid content, free radical scavenging activity, reducing power of aqueous, methanol and petroleum ether extracts were evaluated in this study. Highest phenol and flavanoid contents were found in the aqueous extract. All the three extracts showed potential reducing activity by potassium ferricyanide reduction method. Free radical scavenging activity was determined according to the elimination of DPPH radicals and it was found that Methanol extracts of C. papaya possess the highest radical scavenging activity. These findings suggested that the leaves of papaya might be used as natural antioxidants and can be acts as a major source for drug discovery. Mizoram, a biodiversity hotspot region situated in the extreme end of Himalayan range, is rich in flora and fauna [1,2]. The tribal people in this region are dependent on the forest for treating different ailments and diseases and thus are well knowledgeable over time. Until now, there is no or very less scientific investigation to find out the benefits of the ethno medicinal plant for the native people. Medicinal plants can produce some secondary metabolites having pharmacological activity and thus acts as a major source for drug discovery. These secondary metabolites are not directly involved in the growth and reproduction of the plant, but play a major function in plant defense mechanism. Earlier studies have proved their role in antioxidants, anti-cancer, anti-inflammatory and pain relieving properties . Carica papaya (C. papaya) belonging to family Caricaceae is commonly known as Thingfanghma (in Mizo) and is used as a diuretic- any substance that promotes the production of urine (the roots and leaves), anthelmintic (the Leaves and seed) and to treat bilious conditions (the fruit). C. papaya leaves are made into tea as a treatment for malaria. The juice is also used for warts, cancers, tumors, corns and skin defects while the root is used to help tumors of the uterus. The ripe fruits are used in wounds of urinary tracts, ringworms, skin disease psoriasis and Colon cancer -The fiber of papaya is able to bind cancer-causing toxins in the colon and keep them away from the healthy colon cells . Therefore, the present investigation has been carried out to find out the antioxidant activity of C. papaya, an ethno medicinal plant of Mizoram, North East India. Fresh and disease free C. papaya leaves were collected from Tanhril village, Aizawl district of Mizoram based on the ethano-botanical knowledge (Table 1). The plant materials were brought to the laboratory in sterile polythene bag and stored in refrigerator until processed further. Table 1: Details of plant leaves sampled in the present study. The leaves of C. papaya were air-dried, grounded by a blender followed by extraction with methanol, petroleum ether and water using a Soxhlet apparatus. All the extracts were finally concentrated using rotary evaporator. Total phenolic content of leaf extracts was evaluated according to Folin-Ciocalteu method . Folin-Ciocalteu phenol reagent was added to 0.5 ml extracts and stored for 3 min. 2.5 ml of 7.5% (w/v) Sodium carbonate (Na2CO3) solution was added and incubated at 45°C for 45 min. The absorbance was calculated at 765 nm and the total phenolic content was measured using Gallic acid standard curve. Total flavanoid (TF) content was determined using modified method described previously . The plant extract was mixed with 1.5 ml of methanol, 0.1 ml of 10% AlCl3, 0.1 ml of 1 M potassium acetate and 2.8 ml of distilled water. The reaction mixture was incubated for 30 min at room temp and the absorbance was measured at 415 nm and the total flavanoid content was measured using quercetin standard curve. Ferric reducing activity of plant extracts was performed according to previous study . The plant extract of different concentration was mixed with 2.5 ml of phosphate buffer (0.2 M, pH 6.6) and 2.5 ml of potassium ferricyanide (1%). The mixture was incubated at 50°C for 20 min and the reaction was terminated by adding 2.5 ml trichloroacetic acid (10%) followed by centrifugation at 5000 rpm. 2.5 mL of the upper layer was pipette out in a new test tube and 0.5 ml of FeCl3 (1%) was added and allowed to stand for 30 min before measuring the absorbance at 700 nm. Increased absorbance of the reaction mixture indicated increased reducing power. A0 is the absorbance of the blank solution and A is the absorbance of the extract . Data obtained were expressed as mean ± SEM using statistical software Origin Pro 8 SRO v8.0724 (B724), Northampton, MA, USA. The present study describes the antioxidant and antimicrobial activities of C. papaya used in traditional medicine in Mizoram (Table 1). Plant contain high amount of Phenol and Phenolic compounds which are secondary metabolites and plays a vital role in the antioxidant as well as antimicrobial activity. Table 2 represents the total concentrations of phenolic compounds in the extracts. Phenol content was higher in aqueous and methanol extracts compaired to petroleum ether extract. Aqueous extract had the highest total phenol concentration (57.6 ± 4.69 mg gallic acid equivalents (GAE)/g extract) which is much higher than the Malaysian C papaya peel (15.18 μg GAE/mL) and seed (6.75 μg GAE/mL) reported by Ang et al. . On the other hand methanol extract shows highest flavanoid content (0.34 ± 1.34 μg Quercetin equivalents (QE)/g extract). Table 2: Total phenolic content (TPC) of the leaf extract. Phenolic compound is responsible for the total antioxidant property of plant extracts since they are capable of scavenging free radicals and reactive oxygen species. Phenolic compound contains (-OH) in aromatic ring that confers scavenge free radicals [10,11]. Previous studies have shown that the presence of polyphenol and flavanoid can give a positive effect in scavenging reactive oxygen species. Majority of the phenolic compounds are flavanoid which have antimicrobial, anti-inflammatory, anticancer, and anti-allergic activities [12,13]. Flavonoids and other phenolic have been suggested to play a preventive role in the development of cancer and heart disease . The reducing properties are linked with the existence of reductones that actually exert antioxidant property . The reducing power of the C. papaya was measured using water, methanol and petroleum ether solvent system at different concentrations. Figure 1 shows reducing activity of different plant extract using potassium ferrrocyanide reduction method. The results showed that FRAP values increased with the increase in concentrations. At 500 μg/mL concentration the highest reducing activity was observed from the extract obtained from methanol (Figure 1). The result was in agreement with the previous study of Marina and Noriham  showing the reductive potential of the extracts increased with increasing amount of samples. 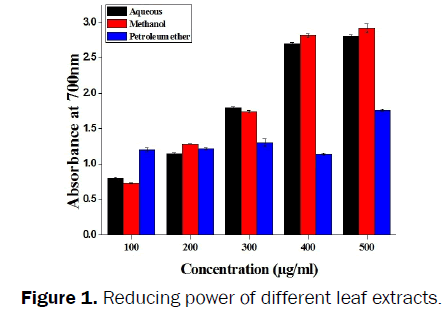 Figure 1: Reducing power of different leaf extracts. Antioxidant activity can be monitored by estimating the electron donation capacity be measured 2,20-diphenyl-1- picrylhydrazyl radical (DPPH) purple-colored solution bleaching. Changes in colour are proportional to the concentration of the antioxidants [17,18]. DPPH scavenging ability of C. papaya plant was screened using aqueous, methanol and petroleum ether solvent system at different concentrations (25–325 μg/ml) and it was found that all the three extracts have potential scavenging activity. IC50 value of C. papaya plant was of 247, 262.18 μg/mL and 171.52 μg/mL for aqueous, methanol and petroleum ether respectively. Figure 2 shows that the percentage of inhibition of DPPH of the tested samples is increased according to the increasing sample concentration which reflects that all the extracts are effective electrons or hydrogen atoms donor to DPPH. Our result showes that the antioxidant activity of C. papaya is higher than the herbal purple sweet potato (PSP) wine, prepared from purple-fleshed sweet potato (Ipomoea batatas L.) and 18 medicinal plant parts . 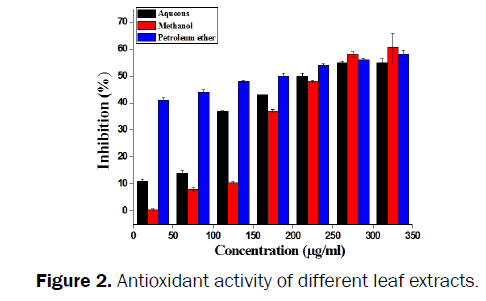 Figure 2: Antioxidant activity of different leaf extracts. In the present study the pharmacological activity of Mizoram folk ethnomedicinal plant C. papaya was investigated using standard parameters. The study reveals that it is having a potential antioxidant power which might be because of the presence of high phenol content. These findings favor it to be use as a primary antioxidant. Although further investigation are needed to fully elucidate its medicinal value. The authors are thankful to the Department of Biotechnology, New Delhi, Govt. of India for the State Biotech Hub (BT/04/ NE/2009) which provided the infrastructural and financial support. The authors report no conflicts of interest. Myers N, et al. Biodiversity hotspots for conservation priorities. Nature. (2000);403:853–858. De Mandal S, et al. Metagenome sequencing reveals Rhodococcus dominance in Farpuk Cave, Mizoram, India, an Eastern Himalayan biodiversity hot spot region. Genome Announc. (2015);3:e00610-15. Dias DA, et al. A historical overview of natural products in drug discovery. Metabolites. (2012);2:303-336. Krishna KL, et al. Review on nutritional, medicinal and pharmacological properties of papaya (C. papaya.). Nat Prod Rad. (2008);7:364-373. Miliauskas G, et al. Screening of radical scavenging activity of some medicinal plants and aromatic plant extract. Food. Chem. (2004);85:231-237. Zhishen J, et al. The Determination of Flavonoid Contents in Mulberry and their Scavenging Effect on Superoxide Radicals. Food Chem. (1999);64:555-559. Yen GC and Duh PD. Scavenging Effect of Methanol Extracts of Peanut Hulls on Free Radical and Active Oxygen Species. J. Agric. Food Chem. (1994);42:629-632. Bruits M, et al. The Antioxidant Activity of the Essential Oils of Artemisia Afra, Artemisia byssinica and juniperusprocera. Phytother. Res. (2001);15:103-108. Ang YK, et al. Antioxidant Potential of Carica Papaya Peel and Seed Focusing on Modern Food Industry. (2012);1:11-16. Raina VK, et al. Essential oil composition of AcoruscalamusL. from the lower region of the Himalayas. Flavour Fragrance J. (2003);18:18-20. Torres JL and Rosazza JPN. Microbial transformations of p-coumaric acid by Bacillus megateriumand Curvularialunata. J. Nat. Prod. (2001);64:1408-1414. Di Carlo G, et al. Flavonoids: old and new aspects of a class of natural therapeutic drugs. Life Sci. (1999);65:337-353. Montoro P, et al. Structure-antioxidant activity relationships of flavonoids isolated from different plant species. Food Chem. (2005);92:349-355. Serafini M, et al. Alcohol-free red wine enhances plasma antioxidant capacity in humans. J. Nutr. (1998);128:1003-1007. Marina Z and NorihamA.Quantification of total phenolic compound and in vitro antioxidant potential of fruit peel extracts. International Food Research Journal. (2014);21:1925-1929. Krishnaiah D, et al. A review of the antioxidant potential of medicinal plant species. Food Bioprod Process. (2011);89:217-233. Saeed et al. Antioxidant activity, total phenolic and total flavonoid contents of whole plant extracts Torilisleptophylla L. BMC Complementary and Alternative Medicine.(2012);12:221. Panda SK, Swain MR, Singh S, Ray RC. Proximate compositions of a herbal purple sweet potato (Ipomoea batatas L.) wine. Journal of Food Processing and Preservation. (2012);35:596-604.